Road Food: A diner diversion with Laverne, Blanche, Delores and other Oakley-ites. The next time you’re in Peoa, or maybe hanging out in Kamas, you should cruise over to Oakley. I hear they have a bang-up Fourth of July rodeo. But Oakley has something else to offer as well: a genuine art-deco diner, built to last in 1939. This classic diner, manufactured in Elizabeth, N.J., by the Jerry O’Mahony Co.—once the country’s leading diner manufacturer—was a large (60 feet by 16 feet), deluxe, streamlined model featuring green Italian marble tabletops, Tiffany glass-roof windows, plenty of chrome, and hand-laid quarry-tile flooring. The diner in Oakley, carrying factory No. 1107, was originally showcased at the 1939 New York World’s Fair. Following the World’s Fair, No. 1107 found its way to Fall River, Mass., and then, eventually, to Middletown, R.I., where, for generations, it was known as Tommy’s Deluxe Diner. Fast-forward to 2007, and Utah (by way of California) businessman Keith Walker gets the crazy idea to buy No. 1107 and move it to Oakley. So, in May of 2007, the historic diner began a historic journey, being hauled to Utah from Rhode Island on country back roads, accompanied by state police cruisers and pilot cars. The diner finally arrived in Oakley in mid-July. “Maybe someday it’ll pay for itself!” jokes Walker, as he ushers in a gaggle of customers who’ve been awaiting tables. It might be way out in Oakley, but Walker’s Road Island Diner is very popular and seemingly always packed, as a historic eatery of this stripe oughtta be. According to Walker, his diner is only one of three diners of its type still in existence, and it was just recently added to the National Registry of Historic Places in Washington, D.C.
“This manufacturer was the Cadillac of diner builders,” says Walker of O’Mahony Co. “It’s the largest one, and also the fanciest one, since it was built for the World’s Fair.” Number 1107 celebrates its 70th birthday this year, and it’s been restored to its majestic, original condition albeit with a few nifty modern additions like air conditioning, TVs and tabletop jukeboxes. Walk through the diner doors, and you’ll step back in time, from the chrome-plated stools and foot plates to the retro servers’ and cooks’ uniforms. The female servers sport large nametags with monikers like Blanche, Laverne, Ruthie, Roxy, Lola and Delores. The guys wear soda-jerk outfits, complete with bow ties and white soda-jerk hats with a sassy trim stripe. 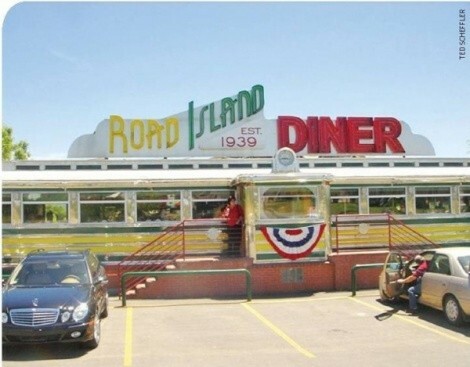 Road Island Diner is open for breakfast, lunch and dinner every day of the week (except dinner on Sunday). And guess what? You can even get booze there. The food ranges all over the place. “We serve diner food,” says Walker. “You’re not going to get hoity-toity food here.” Well, that’s sort of true. But, there’s a lot more to Road Island Diner’s menu than just burgers, fries and shakes—a lot more. Breakfast items range from pancake and French toast combos to ham and eggs, and there’s even a nod to East Coast diner fare with Sue’s Scrapple Plate ($6.39). I don’t know of anyone else serving scrapple in Utah, but maybe that’s a good thing. Naturally, at lunchtime the burgers are the main attraction and range from the basic Road Island Burger ($6.59 w/ fries or chips) to the very popular Smith and Morehouse Burger ($7.89), which is topped with grilled onions and crumbled bleu cheese. Bleu cheese in Oakley? Who knew? Walker knows a thing or two about cheesesteaks, and his namesake Keith’s Spicy Philly Cheese Steak ($7.89) is respectable, although purists might find the pepperjack cheese to be a cheesy violation. Personally, I favor the grilled Reuben ($7.89) at Road Island Diner: rye bread stuffed with thinly shaved corned beef, Swiss cheese, sautéed sauerkraut and Thousand Island dressing. For a little Southwestern spice, try the grilled chicken sandwich with green chiles, Swiss cheese and cilantro aioli; I told you this was more than just typical diner food. A note of caution, though: My wife ordered a blue-plate lunch special “chicken Caesar” wrap ($7.29) for lunch, which turned out to be made with deep-fried chicken rather than grilled. It tasted great but wasn’t what she was expecting. The Road Island Diner dinner menu (available after 4 p.m.) offers appetizers such as fried zucchini ($5.39) and homemade potato chips topped with bleu cheese ($6.39), along with appealing salads like the Weber Road Salad ($7.69): mixed greens, dried cranberries, pecans, apple slices and crumbled bleu cheese (what’s with all this bleu cheese?). Entrees are somewhat limited, since Road Island Diner is primarily a lunch destination, but include meat loaf ($10.59), a SoCal-style lemon chicken dish, stick-to-the- ribs turkey dinner ($10.59), ground sirloin with mushrooms and gravy and, your best and most classic choice, Dutch’s chicken-fried steak ($10.59). Each entrée comes with seasonal veggies, soup or salad, and a choice of potato: mashed, baked, house-cut chips or french fries. That’s a hefty amount of food for $10 and change. There’s a kid-friendly “Little Bandits” menu at Road Island Diner, and I’d be remiss if I failed to mention the fountain offerings, which appeal to kids of every age. You can create your own sundae, enjoy handscooped shakes and blended malts or, better yet, indulge in the “Over the Top” banana split ($5.39). And, for the true hedonist, there’s also the “Ultimate Pig Trough” dessert, which features two bananas, six huge scoops of ice cream and tons of toppings. Hey, you might as well—you’re probably gonna have a long drive home after visiting Oakley’s historic Road Island Diner.